Confrontation between the Ludhiana Municipal Corporation and park management committees today took a new turn with the latter resolving to reject the maintenance fee of parks at the rate of 80 paise per square metre. Responding to the appeal of Mr Anurag Verma, Deputy Commissioner, Ludhiana, the residents of the city have come forward in a big way to contribute towards the CM’s Flood Relief Fund. The Bhartiya Kisan Union (BKU) will launch an agitation from January 10 to press for payment of arrears worth over Rs 80 crore to sugar cane growers and announcement of new support price for the crop. “I started playing tabla and harmonium during kirtans in the gurdwara in Malaysia as I have a passion for music”, says Gunjit Singh. He has cut a popular album ‘Nach Le’ and is going to come out with the second one soon. The Punjab Pradesh Beopar Mandal Mandi Gobinbgarh and Khanna Unit fully supported the decisions taken by the state body at its meeting held recently in Phagwara against the VAT draft, according to Mr G.P. 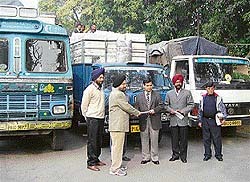 Gupta and Mr Subash Singla, president, and general secretary respectively, of the Mandal. The Alag Shabad Yug Trust organised Prof Puran Singh Dhami Annual Award distribution function at Panjabi Bhavan here today. Around 24 guests from the USA, the UK, Canada and some other countries attended the function. Dr Sarup Singh Alag, chairman of the Trust, highlighted various services of the Trust. 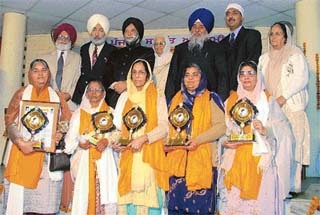 Awardees of Puran Singh Dhami Award with guests at Punjabi Bhavan on Sunday. For people, Kuldeep Singh might just be another entry in the long list of labourers, who have perished in various blasts taking place in factories, but for his wife, he meant the world. Paramjit Kaur (20) had married Kuldeep Singh just 6 months ago and had often seen him off to his journey to various destinations with truck driver Shamsher Singh. She would fear about his safety but never knew that her worst fears would come true in such a manner. Mr Surinder Dawar, Parliamentary Secretary, Power and Housing, exhorted the people to come to the aid of their fellow human beings which was the noblest of all deeds. 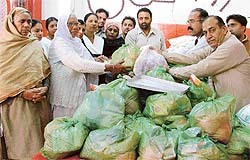 Widows receive ration at a function organised by the Punjab Nishkam Sewa Dal on Sunday. The Punjab Minister of State for Science and Technology, Mr Rakesh Pandey, today emphasised the need for scientific attitude to keep pace with fast-developing technology and global competition. He said in the wake of IT revolution all over the world, the students had to be not only computer literate but also open to changes taking place in the technology. Eight cows died under mysterious circumstances at the Maa Parmapati Gaushala, on the outskirts of the city, on the Ludhiana-Malerkotla road this evening. The gaushala authorities have complained to the Dehlon police that they suspected that some one had given poisonous substance to the cows. Ludhiana: TVS Motor Company’s scooterrette, Scooty Pep, has won the outstanding design award in its category in the recently concluded Business world — INLD Design Excellence awards 2004. NSS girls unit of SCD Government College here organised a lecture on tuberculosis. Dr Pradeep Kapoor, Head of Chest Department, Oswal Cancer Hospital, delivered the lecture. Prof Balwinder Kaur welcomed Dr Kapoor. Dr Kapoor said if a patient had cough for more than three weeks then he/she should be diagnosed for TB. He said not only the disease was prevalent in poor people but was also detected among people from other sections of society. More than 720 patients were examined at a free heart and medical check-up camp organised at Gurdwara Sri Guru Singh Sabha, Model Town Extension, here today. Inaugurating the camp, former Punjab Chief Minister Parkash Singh Badal lauded the efforts being made by religious and voluntary bodies to alleviate people’s sufferings. He also made a special mention of Mr Avtar Singh Makkar, president of the gurudwara managing committee and a member of the SGPC, for organising the camp. 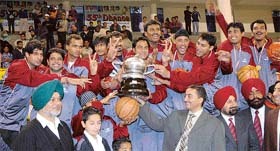 The Uttranchal team which scored its maiden title victory, beating Punjab 75-59, in the 55th Dhanoa Senior National Basketball Championbship in Ludhiana on Sunday. The members of governing council, staff and students of G.H.G. Khalsa College, Gurusar Sadhar, expressed their deep sorrow and grief over the demise of Balkrishan Singh, the doyen of Indian hockey, who passed away on December 31. A condolence meeting was held yesterday at the college campus on Saturday and two- minute silence was observed in the memory of the departed soul.